A mooring and the beach near-by to satisfy everyone! 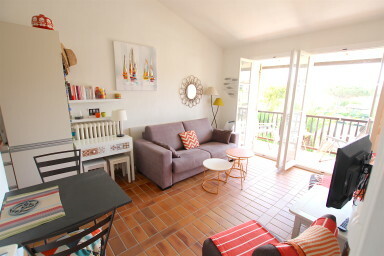 This lovely apartment is located less than 5-minute away from the private beach by walk. It is on the top floor so that the ceiling is high which makes it more comfortbale. It is composed of an entrance, a living-room with an open-plan kitchen, a large bedroom and a bathroom. On the river side, a South-oriented balcony with no vis-a-vis to enjoy the sun. A private parking space down the building. A 10m x 3m mooring. The mooring and the closeness to the beach will satisfy the whole family!